If you had told me a year ago that I would buy and actually use cast iron cookware, I probably would have called you crazy. I'm a chef that was brought up on Teflon, Silverstone and other non-stick surfaces. Frying an over-easy egg and not having it stick was nothing short of a miracle when I bought my first Teflon skillet. That was until a year ago, when I suddenly found myself without a job. While I was home sending out résumés, I turned on The Food Network and began watching some of the hosts prepare delicious-looking food many of them in those heavy, old-fashioned and ugly cast iron skillets. I started to pay more attention to the shows that used cast iron cookware and realized that cast iron had a lot of excellent properties, as long as it was used and maintained properly. So I bought myself a pre-seasoned Lodge cast iron grill pan at Wal-Mart for less than $20, took it home, and decided to make some chicken breasts. Cleaning the grill pan wasn't much fun. In order to remove any grease or food particles, you're advised to use a stiff brush and avoid any detergent soap. If any food residue stubbornly remains, boiling some water in the pan will help loosen it. After using the pan a few more times, it became well-seasoned and much easier to clean. Now it's a snap because I use the pan regularly. I was so enamored with the grill pan that I went out and bought a regular cast iron skillet and began using it religiously for anything that I needed to fry. Again, the pan performed flawlessly. Cast iron is a great conductor of heat, distributing and holding it evenly for long periods of time. I am now one of Lodge's number one fans and have continually added to my cast iron collection to include griddles, corn bread pans, and a Dutch oven, which is essential for making chili, soups and stews. Plus, all Lodge cookware can also be used in the oven, so the versatility is limitless. Lodge is a family-owned Tennessee-based business that has been making quality, cast iron cookware since 1896. Their products are high quality, affordable and belong in the kitchen of anyone who considers themselves a chef. Although I still like my non-stick cookware for certain applications, my Lodge cast iron cookware will continue to be my first choice for most stove and oven recipes. Join in and write your own page! It's easy to do. How? 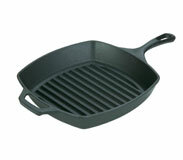 Simply click here to return to Lodge Cast Iron Cookware Reviews.